The Subaru Justy is a comfortable, easy to manoeuvre supermini – but it is a surprisingly pedestrian offering for a car maker that gave the world the hair-on-fire Impreza. The Subaru Justy is tall, so you could get away with wearing a top hat and still not scrape the ceiling. Its cleverly designed interior also ensures there’s enough rear legroom to keep a couple of six-footers happy on a long trip. The boot is similarly well-shaped so accommodates more than you would at first think, while the 60/40 split rear seats fold downwards in one simple movement to leave a flat loadbay for larger items. Running costs are kept low by the always welcome combination of good fuel economy and carbon dioxide emissions low enough to achieve a wallet-friendly band of road tax. Subaru has an excellent pedigree when it comes to making solid, dependable cars and the Justy should not let the side down in this respect. 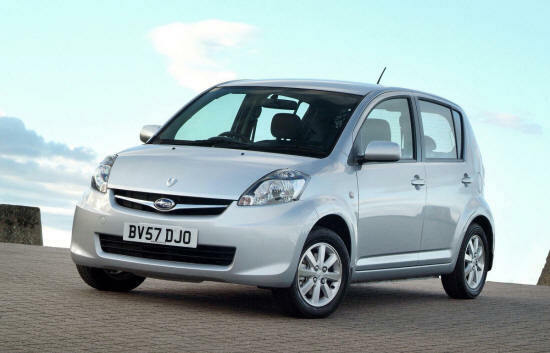 The Justy gives buyers the reassurance of a five-year warranty, but you should have little use for it as the model is expected to be as reliable as its Sirion sister car. The materials used in the cabin are sturdy and durable so young children should have little effect on the interior. The driver benefits from a dashboard that is both stylish and easy to use with a clean simple design and chunky controls. Almost all shapes and sizes can be catered for behind the steering wheel although things would be better if it adjusted for reach as well as rake. The Justy gives occupants a panoramic view of the road and surrounding fauna and flora thanks to the large windows. The Justy is a pleasant place to spend time, especially around town, with light controls making the car easy to drive while the quality of the interior means passengers enjoy the journey. It is perhaps not the most refined of superminis at higher speeds though as more road and wind noise make it into the cabin than is desirable. On tight and twisty roads the Justy suffers from less grip than is ideal and the handling is a bit uncertain. The boxy looks are distinctive and help the Justy to stand out from the crowd while the comfortable ride is a bonus in the urban jungle. The Justy will make the green brigade, or those who wish to leave an inhabitable planet for their kids to live on, smile as the engine puts out just under 120g/km of carbon dioxide – a respectable performance by a supermini. Its mixed news on the security front for the Justy as although an alarm is fitted, there are no deadlocks to deter smash-and-grab criminals. As far as safety is concerned the Justy comes fitted with front, side and curtain airbags as standard, along with anti-lock brakes linked to the latest electronic stopping aids. There are two versions of the Justy – one badged ‘R’ and the other ‘Twin Cam’. Both have alloy wheels, parking sensors, remote central locking, four electric windows, air conditioning and a CD player with MP3 input. The Twin Cam adds tinted rear glass, spoiler, sports exhaust, an alloy gearknob and white stripes for the bonnet and sides. The audio system sounds decent but no satnav is available. The Subaru Justy is an incredibly spacious supermini – displaying Tardis-like qualities as from the outside it doesn’t look that big. Subaru became famous for four-wheel drive saloons and estates with powerful engines – so the Justy marks a departure for the company. In fact the car is a rebadged version of the Daihatsu Sirion with both cars sharing the same upright exterior styling and roomy cabin. The Justy is driven by a three-cylinder 68bhp 1.0 litre petrol engine which is best suited to the urban jungle, as on the open road the pedal well and truly has to be pressed to the metal and the five-speed gearbox worked hard to achieve even average acceleration. So when asked to deal with a full load or a long journey the Justy has its hands full.